Artistʻs view of a newborn giant planet like the one newly discovered at the immediate vicinity of the very active infant star V830 Tau, as might be seen by an observer located close to the giant planet. Brightness and magnetic spots at the surfaces of V830 Tau induce spectral perturbations much larger than those caused by the reflex motion of the detected giant planet. Activity perturbations are shown in the top panel, with the blue arrow depicting the spectral velocity shift (scaled up by 20x) that activity generates. The bottom panel illustrates the combined effects of activity and of the detected planet on the spectrum of V830 Tau, with the blue / green / red arrows respectively showing the velocity shifts induced by activity, by the giant planet, and by both (scaled up by 20x). Click on the links for animations of the profile distortions induced by the spotted star, and by the spotted star plus the planet. The novel collaboration between the Gemini Observatory and Canada-France-Hawai‘i Telescope (CFHT) called GRACES (Gemini Remote Access to CFHT ESPaDOnS Spectrograph), helped to characterize a “hot Jupiter” around the T-Tauri star V830 Tau. The work appears in the current advanced online issue of the journal Nature. GRACES uses an innovative 270-meter fiber cable to transport light from the Gemini 8-meter telescope to the ESPaDOnS Spectrograph at CFHT. The system began operating in late 2015 and now is a popular option allowing Gemini and CFHT users to perform high-resolution optical spectroscopy with Gemini North’s larger mirror. For the last 20 years the giant planets known as hot Jupiters have presented astronomers with a puzzle. How did they settle into orbits 100 times closer to their host stars than our own Jupiter is to the Sun? An international team of astronomers has announced this week1 the discovery of a newborn hot Jupiter, orbiting an infant sun — only 2 million years old, the stellar equivalent of a week-old human baby. The discovery that hot Jupiters can already be present at such an early stage of star-planet formation represents a major step forward in our understanding of how planetary systems form and evolve. For this discovery, the team monitored a 2 million-year-old infant star called V830 Tau, located in the Taurus stellar nursery, some 430 light-years away. Over the 1.5 months of the campaign, a regular 4.9-day “wobble” in the velocity of the host star revealed a giant planet almost as massive as Jupiter, orbiting its host star at a distance of only one-twentieth that of the Sun to the Earth distance. “Our discovery demonstrates for the first time that such bodies can be generated at very early stages of planetary formation, and likely play a central role in shaping the overall architecture of planetary systems” explains Jean-François Donati, CNRS astronomer at IRAP / OMP2 and lead author of a new paper in the current issue of the journal Nature. The team used the twin spectropolarimeters ESPaDOnS and Narval to monitor V830 Tau for a total of 47 hours. ESPaDOnS is mounted at the 3.6-m Canada-France-Hawaii Telescope3 (CFHT) on Maunakea and can be fiber-fed from either CFHT itself, or via GRACES, a 300-m optical-fiber link from the nearby 8 meter Gemini North telescope. The team used ESPaDOnS in both modes, providing the opportunity to monitor the star using light from the Gemini North telescope when the instrument was unavailable at CFHT. The team also used Narval, mounted at the 2-meter Télescope Bernard Lyot4 (TBL) atop Pic du Midi in the French Pyrénées. “Using all three telescopes was essential for monitoring regularly V830 Tau throughout our campaign and for detecting its giant planet” stresses Lison Malo, CFHT astronomer, a coauthor of the study and leader in coordinating the observations. In our Solar System, small rocky planets like the Earth are found near the Sun, whereas gas giants like Jupiter and Saturn orbit much further out. “The discovery in 1995 of a giant planet flying very close to its host star took us by surprise and revolutionized the field” recalls Claire Moutou, CNRS astronomer at CFHT and a coauthor of this new study. Theoretical work indicates that such planets can only form in the cold and icy outer regions of the protoplanetary disc in which both the central star and surrounding planets are born. Some, however, migrate inwards without falling into their host star, thus becoming hot Jupiters. “Planet formation models offer two competing explanations of how and when this migration of hot Jupiters occurred. Either it happened early while these planets were still forming, or much later, with some planets being kicked closer to their stars due to the interaction of multiple planets, or both” explains Clément Baruteau, CNRS astronomer at IRAP / OMP and a coauthor of this study. “Our discovery demonstrates that the first, earlier option is taking place; it revives the long-running debate about how and when this migration occurs, and brings us one step forward in our understanding of how planetary systems form”. 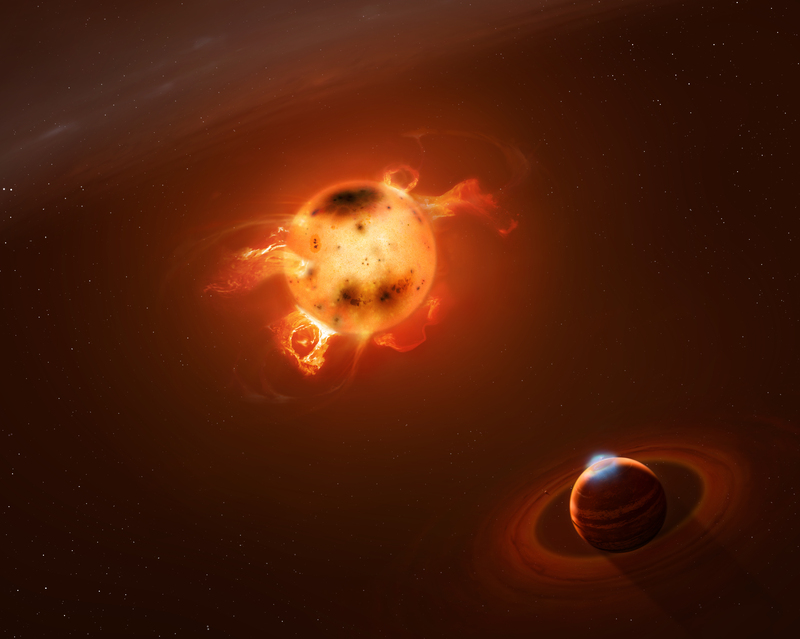 Among the known hot Jupiters, some feature strongly-tilted or even upside-down orbits, suggesting they were knocked into close orbits by interactions with other planets or neighboring stars. Others orbit above the host star’s equator, hinting at a more gentle formation process in the form of an inward drift through the disc. “The young hot Jupiter we just detected comes as the first evidence that early disc migration is also happening” says Andrew Collier Cameron of the University of St Andrews, a coauthor of the study. “SPIRou and SPIP, the twin new-generation instruments built for CFHT and TBL by our team and scheduled for first light in 2017 and 2019 respectively, will offer vastly superior performances for such programs, and will soon allow us to explore the formation of new worlds with unprecedented sensitivity”, adds Louise Yu, a coauthor of the study and PhD student in observational exoplanet science at IRAP / OMP.